I’ve received a lot of questions from new nurses saying that one of their biggest struggles is learning how to trust your nursing judgement. You think you know what you’re doing, but you’re not sure… and are constantly questioning yourself, doubting yourself… how do you get over the hump? 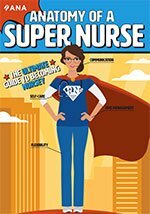 How do you go from unsure newbie to confident nurse? I posed this question on my Facebook Page to experienced nurses and they had some amazing responses. As a new nurse, I also struggled with this and wanted to compile their responses with my own experiences. Onward! Again, I completely identified with this. I started to notice I went from being way off base or almost correct… to being right most of the time. And it. felt. amazing. via GIPHYI know, it feels pretty awesome. The pieces just sort of start to fall together and all of the pathophysiology you learned in nursing school comes together with all of that time management / patient care you’ve been learning throughout orientation. Ding ding ding! YES! A few months after I started as a newbie, a new crop of nurses started as well as a few new CNA’s. I was thankful to have more new people on the unit who were hopefully as lost as I was. Yay friends! But, I noticed that when they started asking me questions… I actually knew some of the answers. via GIPHYI quickly went from the most lost person on the unit to someone who knew the unit relatively well, could navigate many issues, and knew who to call when I was stuck. And soon, it wasn’t just the other new employees asking me questions, fellow nurses starting asking me what I would do or what I thought about a certain situation. The first time it happened, I had one of those, “did he just ask ME what I thought!? What parallel universe is this!? I’m the new one who doesn’t know what she’s doing!” moments. I collected myself and provided the answer I thought was best, and he agreed. via GIPHYYes. Yes, I did. And finally, of course… I would be remiss if I didn’t mention how important it is so give it time. And I think that is a wonderful note to end on. Thank you to all of the experienced nurses who responded on FB, offering their advice and encouragement to all of the newbies out there. Did we leave anything out? What’s been your experience with learning how to trust your nursing judgement? Are you currently on orientation – what are you struggling with? Monthly subscription to a ton of nursing resources, which includes the MedMaster course + test-taking, EKG’s (incredible explanations of this as well! ), NCLEX® questions, med-surg, fundamentals, OB, cardiac, and more. Need more in-depth cardiac info? Check out the Cardiac Nurse Crash Course brought to you by FreshRN® where we discuss essential topics like hest tube and arterial line care, cardiac nursing report for the ED/ICU/floor, CABG patient care, in-depth discussion on atrial fibrillation, diagnostics like stress tests and caths, and much more! I’m a new nurse (7 weeks into my 12 week orientation) and I have asked myself and my preceptor this question. She says to give it time. It’s encouraging to know that nursing judgement will come. My thing is, I ask so many questions right now, and I’m hoping by the 12-week mark I’ll be able to ask less, because it can be time consuming to have to ask so many questions. I want to be safe, so I will still ask questions if I have them. I’m just wondering, is there a timeline for the average orientee where we are able to ask less questions…or does that come with growing in our nursing judgment? It just comes as your nursing judgement grows. And do not ever put a deadline on asking questions. If you have them, ask!